I think its rookie because he was the 1 who let the bugs out, and they could have rebuilt it! Hmmm.... Maybe the old misions will be back!!!!!!!!!!!! I mean, these words in the signal were Herbert words, for sure! who rebuilt this dreadful creature? No one is quite sure, but many guess that Herbert Polar Bear, Esquire and his accomplice, Klutzy the Crab, are behind this. Guess again. The new wilderness expedition explains much. Gears, gadgets, grapples, experiments! And they all lead to the brown puffles.﻿﻿..
Do you see what I’m saying? The brown puffles rebuilt the ultimate protobot! But did they do it on purpose? Or did they simply find old parts and put them together? We will have to wait and see. Typo mimo! 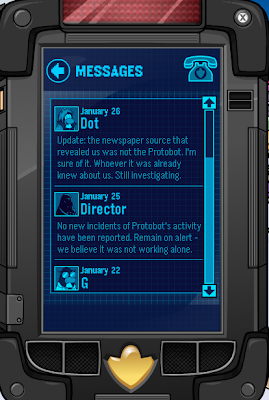 it is she doesn't believe the source THAT revealed the EPF is the Probot. mimo y is the the after source supposed to say that?? i think Herbert found the brown Puffles and they got away and rebuilt ultimate Protobot for some reason. and i think club penguin is gonna give us a epf misson where we try to find out who rebuilt the ultimate Protobot! you guys might be thinking its herbert who did it, but guess again! its the brown puffle, don't you see guys? the wilderness expedition, the machines and gear stuff on the wilderness trail, and this cool tech in the brown puffle cave. so what i'm trying to say is that the brown puffle rebuilt protobot. I think it's the brown puffle because of how close the events were. Yonadav also has a good point though. Herbert has been quite quiet making him seem innocent. Good suggestion! I hope your right! I don't know if it was a one time thing, but when I left the shore on the boat to the puffle cave, everyone on the shore, went across the water with me, not on the boat. I think it is a glitch. It better not be Herbert. It's always Herbert! Since disney took over my friend and I have been able to predict everything EPF, PSA and more! The reason it's proven Herbert is because the big hint is because they capitalized Genius's when he said "never trust a robot to do a genius's Work. I KEEP not getting the messages!! ~~~~~~~~~~~~~~~~~~~~~~~~~~~~~~~~~~~ Oh come on. You could give Rookie a little more credit than... Actually yeah, it probably was Rookie... Good thinking. Yeah! Maybe the old missions will be back. Just in EPF form. I wonder what Herbert has been doing all this time. Yeah. But Herbert might have the Brown Puffles already working for him. Either way, this is all very confusing. I hope we get more information soon. Wait. Could you repeat that for me again? The messages have been acting weird for me too and I'm a member so you're not the only one. Don't worry. I think it's just ANOTHER Club Penguin glitch. If you need any help making those things you can ask me what things I have in my Messenger Bag that could help. Trust me, there are alot of things in there... I'm still trying to figure out what to do with this old piece of pipe! That would be awesome! Thanks for the cool idea! Yeah. I think this investigation is getting reeaal close to an access point beyond the wilderness. Whatever that means. I wonder what will be the outcome of all these events. That happened to me too. I'm just like, "Ah! Why are you all coming with me???" Yeah. Pretty sure it's Herbert too. Lets keep standing on our tippy flippers for this one! This has been happening to me too. Lets hope Club Penguin fixes this soon. I named my brown puffle Hephaestus, after the greek god who builds stuff. Hm. This is a really difficult dission between Herbert and the brown puffle. I think Roockie was part of the team too. He let the bugs out in the first place. But the Brown Puffle and Herbert work together. I dunno y? i think it was herbert as an anonymus guy, i mean, no one in EPF would let know the newspaper that it really exists. the only two guys that know it are herbert and protobot. if protobot wasn't, then it was herbert! Second: Does anyone remember the old PSA mission spy and seek? because at the end herbert said "My next plan invovles puffles, LOTS of puffles" could this mean that he either found or possibly "created" the brown puffles to help him make gadgets? I think so. Third and last: hmmm i forgot what i was gonna say. oh well, I LIKE CHEESE! One word... HERBERT! (sorry for caps Mimo) I mean, who else could it be, maybe Clutzy too. why i dont recive emails on my spy phone? I don't know... i'm a member but i never get messages it's weird. The only way i get messages is if I stay on for a while. Strange! I'm not getting any of these messages! The clues are coming together! I checked you typo me, Mimo. Im a proud Bin. Anyway, isnt it System Defender is NOT releasing new games YET? ITS HERBERT! he knew about us on the ds game!of course! he build back the ultimate protobot and wants to destroy the epf!we shouldve known! what will happen to the brown puffles?or are they robots disguised as burgers shaped like puffles?!aaaahhh!!!! Something weird is going on on CP... I can't get on, there's just a blue box and the spinning arrows. Are they updating again? Herbert nor Klutzy could have known because they weren't here in the 1st game in the Epf game.Mysterouis.I wonder if the brown puffle made the test robots because they like machines.Also the test robots rebuilt protobot. Maybe all the machinery was an act, and the brown puffles are trying to infiltrate the EPF HQ? So they can make the biggest and best-est protobot for Herbert; giving Herbert P. Bear Esquire the power to take over CP? That theory is definitely strange.....Ly possible! It sounds right on the cue. Well, it IS a little far-fetched; but still! Great imagination and keep it up!